On Monday, February 25th we headed for Michigan to deliver some of the children to their various care providers. We are so thankful for them. We could not have been part of the traveling team without the faithful care of the ones who took over for us in the parenting department while we were gone. Lois and Andrea stayed with their older sister Hillary and their brother-in-law Terry and their nephews, Riley and Wyatt. Timothy was a guest in the home of the Duncan Family near our daughter. Jim drove on down to Dayton, Ohio with Seth and Andy to stay part of the time with their older brother, Jeremiah and their sister-in-law Lisa and their boys, Rayne and Skylar, then on to visit the Stanley Family. We began our long flight on Wednesday the 27th. After many long hours in our seats, visiting with team members, eating, sleeping, watching movies and generally being bored we finally arrived in Manila. It was the middle of the night when we arrived and the city was alive with people. We were immediately aware of the huge contrasts of the city. There were large and beautiful buildings and right next to them habitations of the squatters, make shift homes put together with simple reclaimed items. There were people young and old in the streets and many places of business opened all night. We were met by an group from the church to deliver us safely to our home away from home. 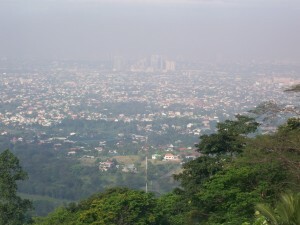 It was a hotel away from the heart of Manila that was perched on the side of a hill with a wonderful picturesque view of all of Manila. The view was worth a thousand words, as they say. We stayed here for about a total of two weeks, with a break between the two for a trip to Negros. One of the things I noticed first about the Filipino people was that they are diligent. I saw so many people sweeping, men, women and children. I told Jim I wanted to bring one of those brooms home and hang it where I would be reminded of the hard working Filipino’s. Another thing that stood out was their warm and friendly way. The people were so kind and friendly. When we went shopping the people who worked in the stores were constantly greeting us with, “Morning Mum, morning Sir.” The Mum only sounded like Mum. It was just the way they pronounced the mam. The Filipino people are very easy going people. This was evident in the way they drive. They drive with much fewer rules of the road than we American’s have but when there are many in a crowded intersection with no specific rules they all seem to work it out with little fan fair. I heard many horns beeping but not yelling or angry looks. 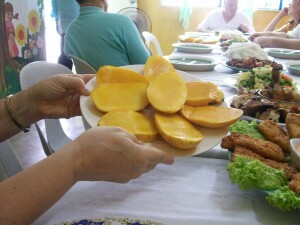 We loved the mangoes and bananas and the banana candy tasted so good to me, just like dates. The fish was good and I think Jim would say his favorite were the mango shakes. The times we spent in actual focused ministry were totally wonderful and eternally rewarding. When we stood before crowds of several hundred in school meetings, the children were totally receptive and appreciative. When the gospel was presented in its simplicity the children and adults listen with great interest. When the invitation to trust Christ as personal savior was given, hundreds prayed a simple prayer in unison, with sincerity and earnestness that made my heart pound in my chest. I can tell you I felt such joy in presenting hundreds of Bibles one at a time to eager hands and happy smiles. The children then asked us if we (Jim and I and other team members) would please sign them. We did and included our life verse after our signatures. I can also tell you that I felt such shame and sadness when I ran out of Bibles. Why could we not have taken more? When we were in the homes and churches of the Christians we were treated with great kindness. 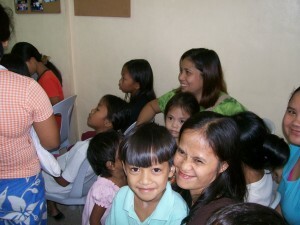 We went to the Philippine’s to minister and encourage but we came away being encouraged and ministered to. There are too many things to write about but if you would like to ask questions simply send me an email and I will do my best to answer any questions you might have about our trip. love you… yummy… I could sure eat a few mangos. Good morning from my perch in the woods.